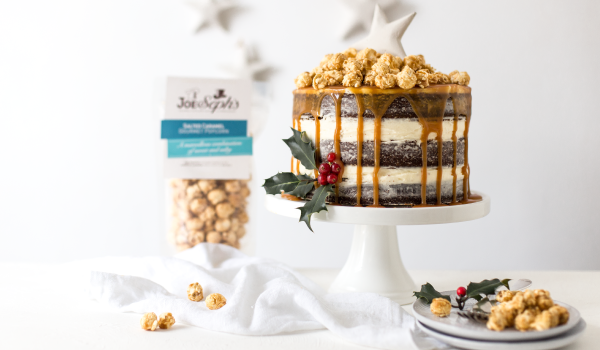 SINCE 2010, Joe & SEPH'S HAVE BEEN RENOWNED FOR MAKING AWARD-WINNING POPCORN USING THEIR SECRET SMOOTH CARAMEL RECIPE. ... OR JUST DEVOURING STRAIGHT FROM THE JAR! 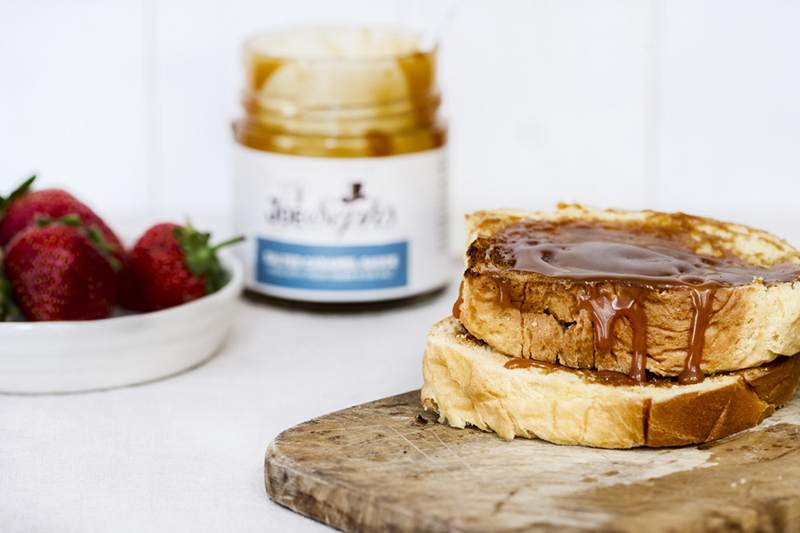 HERE ARE A FEW RECIPE IDEAS FOR OUR CARAMEL SAUCES TOO, BUT IF YOU HAVE ANY GREAT IDEAS YOURSELF PLEASE GET IN TOUCH AND WE'LL PUT OUR FAVOURITE ONES ON THE WEBSITE! Rich and intense chocolate indulgently combined with our wicked Espresso Martini Caramel sauce and a whipped mascarpone frosting. 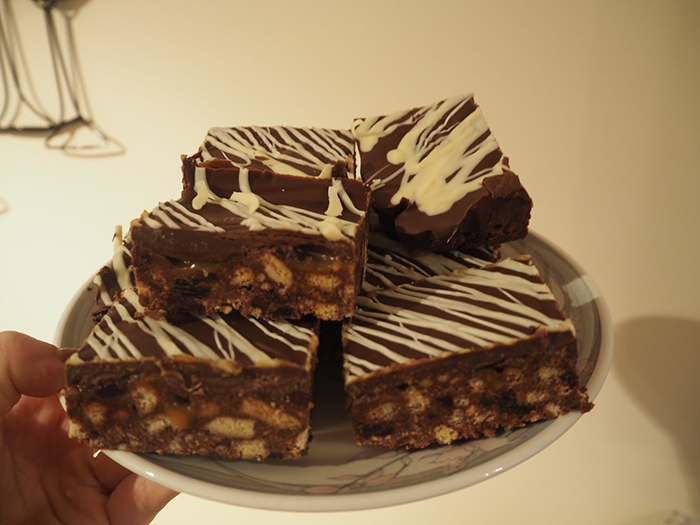 Thanks to @EmMoreton for creating this stupendous traybake recipe! 1. Preheat oven. Grease a rectangular baking tray and line with baking paper. 2. Dissolve coffee in a tbsp of boiling water. Place in a Bain-marie with chocolate and butter. 4. Once everything has melted, remove from the heat and whisk in sifted cocoa and sugar, and then eggs. 5. Combine plain and self-raising flours, then sift into mixture and stir. 6. Stir in coffee liqueur and vanilla extract. 7. Transfer mixture to the baking tray. Cook in a moderately slow oven (160°C) for about 45 mins, or until a skewer inserted into the centre comes out clean. Then remove from oven and allow to cool completely in the baking tray. 8. Ideally make the whipped mascarpone topping when ready to serve. Whisk mascarpone, butter, icing sugar, salt and liqueur until it becomes whipped. 6. Spread the frosting onto your brownies. Then generously drizzle with Joe & Seph’s Espresso Martini Caramel Sauce, espresso and a sprinkling of dark chocolate. 2. Grease 3 x 20cm round cake tins and line with greaseproof paper. 3. In a large bowl, combine flour, salt, bicarbonate of sofa and ginger and make a well in the middle. 4. Pour the treacle, golden syrup and butter in a pan and warm gently until the butter has melted and the mixture is smooth and combined. 5. Stir in the milk and stem ginger. 6. Pour the mixture into the well of the dry ingredients and mix well into a smooth batter. 7. Pour the batter into the prepared tins and bake for about 40 minutes until risen and firm to the touch. 8. Leave the cakes to cool in their tins and then transfer to a wire rack to cool completely. 1. Beat softened cream cheese and butter together until fluffy and lump-free. 2. Slowly beat in the powdered sugar until smooth. 3. Stir in the vanilla paste. 4. Tightly cover and refrigerate for 10 minutes. 1. Place one layer of cake onto your stand. 2. Dollop ¼ of your frosting on top of layer and spread evenly. 3. Repeat with other 2 layers. 4. Spread remaining frosting on top and the side of the cake and then refrigerate for 1 hour. 5. 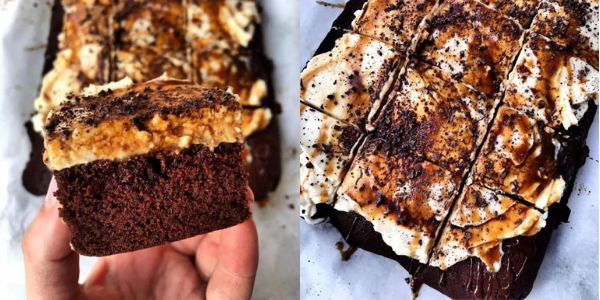 Remove cake from fridge and drizzle Joe & Seph’s Salted Caramel Sauce over the top, allowing it to drip down the side. 6. 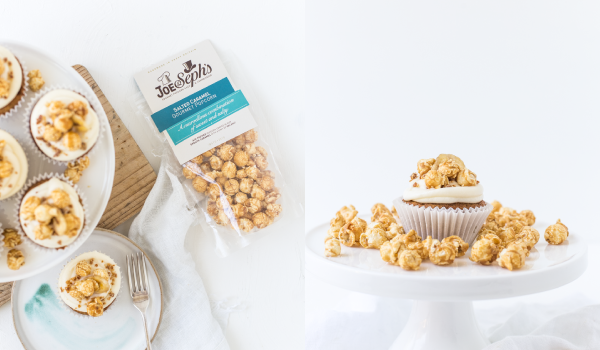 Top with 1 x Joe & Seph’s Salted Caramel Popcorn Pouch and serve! 2. Put the butter and 2 tsp of the sugar in a saucepan with 150ml water. 3. Place the pan over a low heat until the butter and sugar have melted, then bring to the boil. 4. Take off the heat and add all the flour at once and beat with a wooden spoon until the dough comes away from the side of the pan. 5. Leave to cool for 5 minutes then beat in the eggs bit by bit until you have a stiff, glossy mixture. 6. Rinse 2 baking trays with cold water, shaking off excess so they are slightly damp (this helps the pastry rise). 7. Using 2 teaspoons, spoon blobs of the mixture onto baking trays. 8. Place in the oven for 18-20 minutes until well risen and brown. 9. Remove profiteroles from the oven and cut a small slit in the base of each one so they don’t collapse. 11. Once cool, whip the cream lightly until just holding its shape. 12. Sweeten to taste with the remaining sugar and vanilla extract. 13. Cut the profiteroles in half and fill them with the cream and pile them up on a plate. 14. Melt your Joe & Seph’s Brandy Butter Caramel Sauce in the microwave/over the hob until runny (it won’t take long). 15. 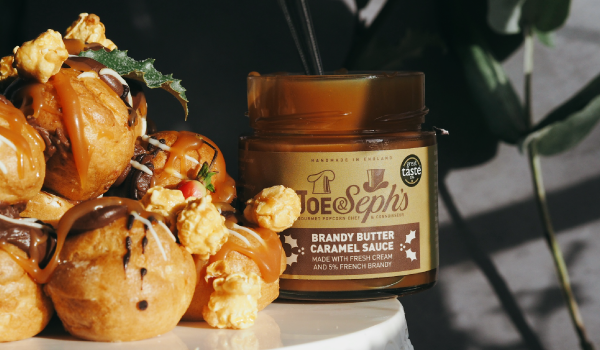 Drizzle the sauce over the profiteroles along with the Joe & Seph’s Brandy Butter Popcorn. 1. Bring prosecco, sugar and water to the boil in a saucepan, then remove from heat. 2. Squeeze excess water from gelatine and stir into prosecco mixture to dissolve. 3. Divide jelly evenly among 8 small glasses (about 250ml each) and refrigerate overnight to set (jelly will keep for 5 days). 1. Split the vanilla bean along its length. 2. Heat the water, sugar and vanilla over a medium-low heat in a saucepan, stirring occasionally until dissolved. Let cool completely and remove vanilla bean. 3. Pulse the pears in a food processor for a few minutes, scraping down the sides with a spatula until smooth. 4. Combine the pears with the cooled simple syrup and lemon juice in an airtight container and chill in the fridge for around 30 minutes. 5. Pour mixture into a large casserole or baking dish and cover with plastic wrap. 6. Place in freezer and stir ever 20 minutes until mixture is crumbly (about 3-4 intervals). 2. Place sugar on a plate and press the pear slices into it. 3. Place the slices on baking trays lined with baking paper and bake for 15 minutes. • Cool on wire racks until crisp. 1. Remove jelly from fridge. 2. Crumble 2 x heaped tbsp of the Pear Granita on top of the jelly. 3. Place a Pear Wafer onto the granita. 4. Top with Joe & Seph’s Prosecco Popcorn! 5. Cook for 1 minute, then gradually whisk in 500ml whole milk until your sauce has no lumps. 6. Simmer for 5 mins whisking until thickened. 7. Take off the heat and stir through your grated mature cheddar and parmesan. 2. Place the chocolate in a heatproof bowl over a saucepan of simmering water and cook, stirring occasionally for 5 minutes until smooth. Set aside to cool for 5 minutes. 3. 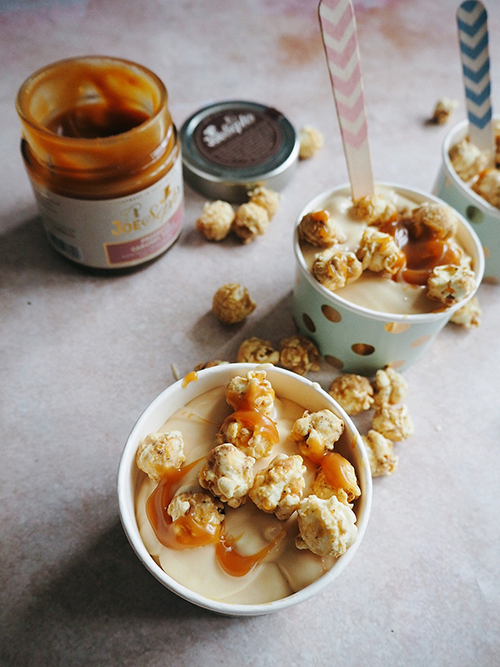 Combine the Joe & Seph’s Salted Caramel Popcorn, peanuts, marshmallows and biscuits in a bowl. 4. Once cool, pour over the melted chocolate and combine well. 5. Spoon the mixture into the pan and place in the fridge for 2 hours or until set. 6. Cut into pieces and serve! 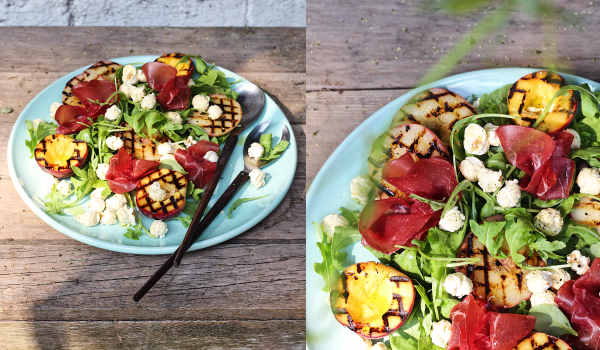 Massive thanks to @twisingmymelon and @getbakedwithsonia for creating this amazing recipe! • For your base, mix all the ingredients together and press down into a cake dish and even out. • Place base mixture into freezer and get started on your chocolate later. • For the chocolate layer, melt the cacao butter and coconut oil in a pan on a low heat. • Separately, add the soaked cashew nuts, coconut milk and maple syrup to a food processor/blender and mix until creamy and smooth. • Once blended, mix into your melted cacao butter and coconut oil until well combines. • Get your base out of the freezer, pour the mixture on top and pop it back into the freezer to get started on the next vanilla layer! • For the vanilla layer, combine cashews, coconut milk and maple syrup in a food processor/blender until creamy. • Pour in cacao butter, coconut oil and vanilla extract and blend until creamy. • Remove your cake tin from the freezer and add the vanilla layer. 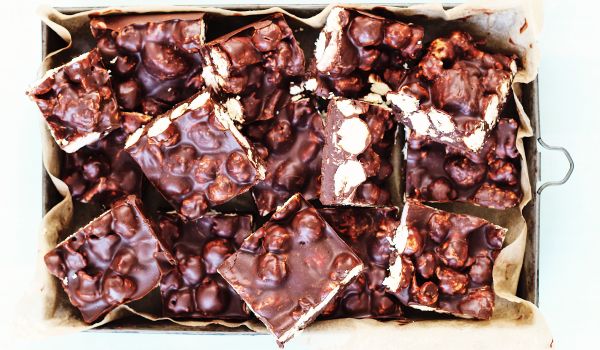 • Place back in the freezer for 2 hours and get started on the brittle. • For the chocolate brittle, start by melting your chocolate. • Place some cling film onto a flat surface (you will want a wide surface area! ), pour over your melted chocolate and spread evenly (it wants to be quite thin). • Add the Joe & Seph's White Chocolate & Vanilla Bean chopped popcorn and salt, and pop into the fridge. 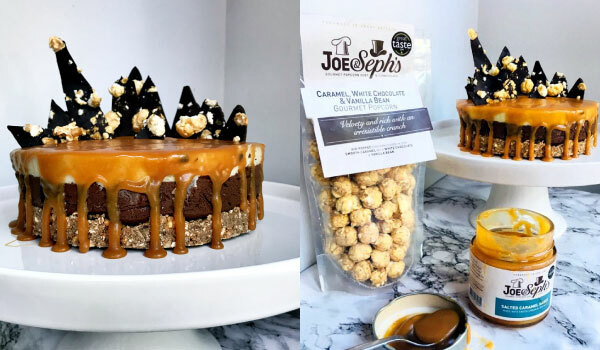 • After 2 hours, take the cake out and layer over your Joe & Seph’s Salted Caramel Sauce. 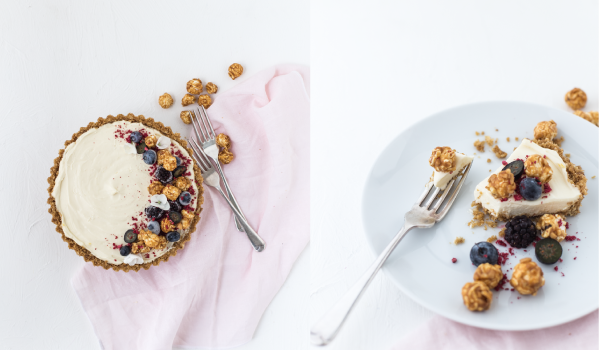 • Break up your brittle and place the shards on top of the cheesecake. 1. Add the banana, egg and oats to a blender and blend until you have your batter (add more oats if it isn’t thick enough). 2. Melt a knob of butter in a frying pan over a high heat. 3. Add heaped dollops of the batter to your frying pan (normally fits about 3) and top with a few frozen berries (this makes them super delicious!). 4. Fry until bubbling on top and then flip. 5. In the meantime, put a handful of frozen berries in a separate pan on a high heat with 100ml of water and leave to simmer for 5 minutes to create your delicious berry compote. 6. Repeat process 3 & 4 until you’ve used up your batter. 7. When the pancakes are ready, top with your compote and slather Joe & Seph’s Salted Caramel Sauce on to your hearts content. 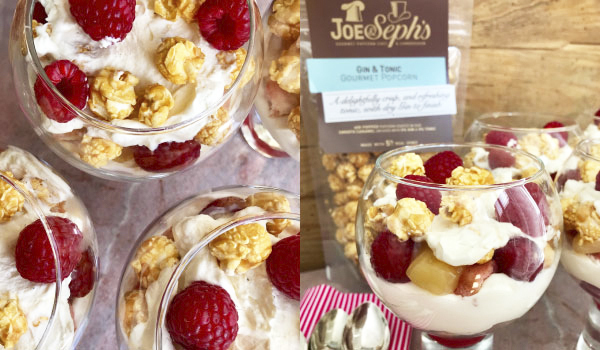 Thanks to @becksbake for creating THE most indulgent Joe & Seph’s Masterpiece! Grease and line 3 x 8inch cake tins. Preheat the oven to 150C (fan). In a large bowl beat together the sugar, oil, eggs, buttermilk and vanilla extract until smooth and well incorporated. Sieve the flour, bicarbonate of soda and cinnamon straight into the bowl and fold in until smooth. Peel, core and chop the apples into small chunks about 1cm cubed (approx). Stir into the cake mixture. Share the mixture between the three tins evenly, bake for 45mins or until golden brown on top and a cocktail stick comes out clean, check a couple places in case you hit a piece of apple. Once baked leave to sit for five mins before removing from the tins and cooling completely on a wire cooling rack. Whilst cooling make the buttercream. Cube the butter and put the butter in a large bowl and beat well until it starts to lighten in colour. Add the icing sugar and stir in gently to incorporate into the butter, add a tablespoon of hot boiled water to help incorporate the sugar. Once the sugar clouds have subsided beat well to make it smooth. Add another tablespoon of hot boiled water to soften the mixture to make it easier to use. To Decorate… Well a picture speaks a thousand words, so head to Becks Bakes to see a step by step photo guide on how to bake and construct this masterpiece! 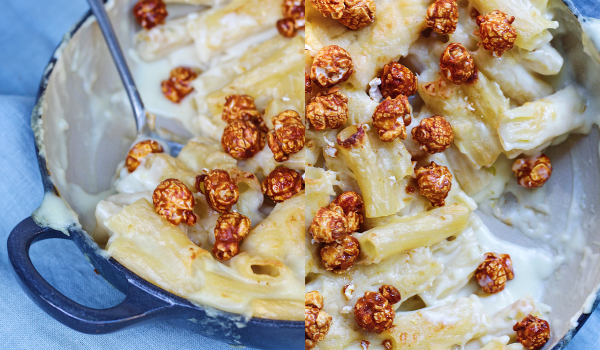 Thanks to the @culinarybee for sharing this yummy recipe! 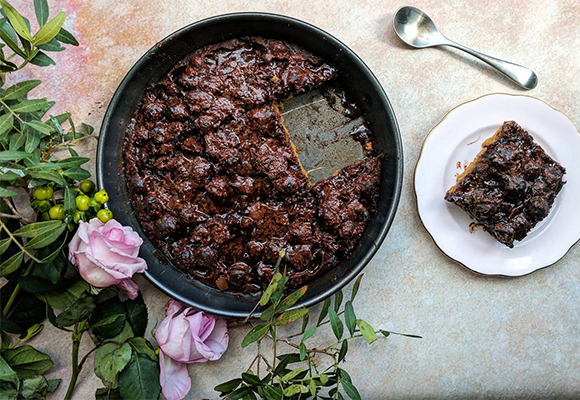 "My family's absolute favourite pudding in the entire world, so I thought I had to share this recipe with you. I usually serve with a tart creme fresh to balance the sweetness of this pudding." Start by greasing a baking dish with butter. In a bowl, add the chopped dates, and pour approx. 180ml of boiling water over them. Leave for around 10 minutes until they have completely softened. Blitz with a food processor, or mash with a fork until they have combined. In a large mixing bowl, cream your sugar, eggs and butter together, for approx. 5-6mins by hand, until it starts to look creamy. Then add the flour, bicarbonate of soda, molasses, cinnamon and vanilla, and mix together. Add the date mixture. Stir until everything is mixed together. Pour the mixture into your prepared baking dish and bake for around 35 minutes – or until a skewer runs clean through the middle. 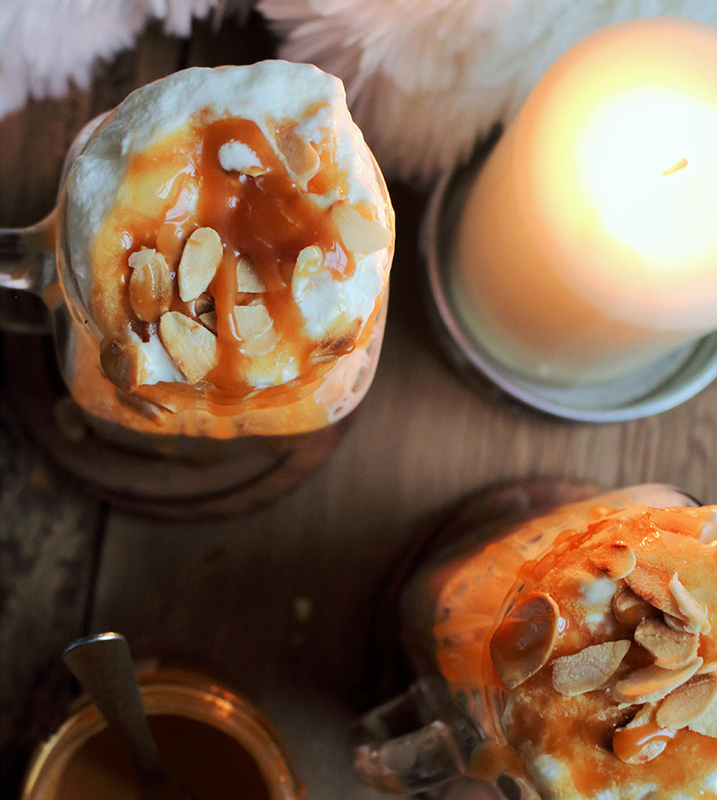 Finally pour over the 2 jars of Joe & Seph’s Salted Caramel Sauce and serve! 1. Simply blend together all the ingredients using a blender. 2. 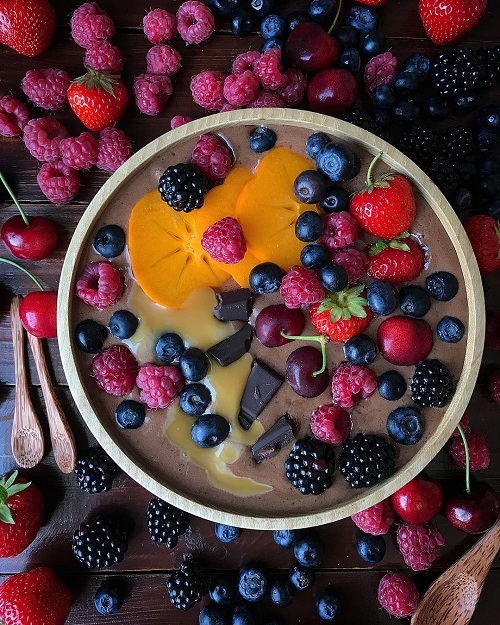 Serve topped with extra fruit, berries and Joe & Seph's Caramel Sauce! 1. To cut the pineapple, cut off the top and bottom using a large Chef's knife, and carve away the skin. Don't eat the core of the pineapple, so carve large chunks around it ( almost like how you cut up an apple). Cut the slices in half. 2. In a large saucepan, add the rum, brandy, butter, sugar, and star anise in and leave to boil. When it has reduced by half, add the vanilla paste and then add Joe & Seph's Rum & Raisin Caramel Sauce in, stir until mixed. 3. 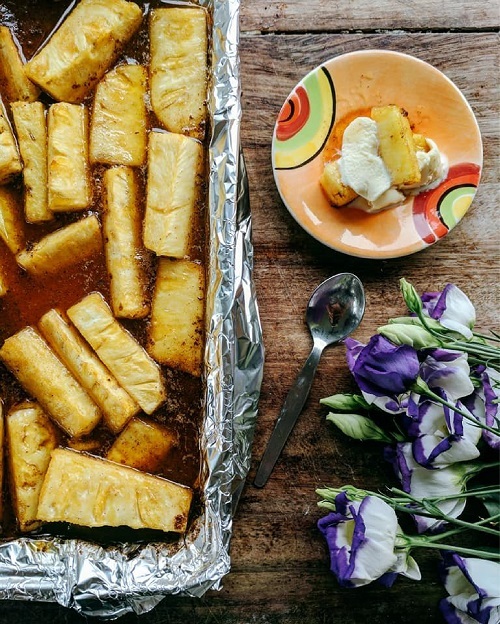 On a wide baking tray lined with foil, place the cut slices of pineapple, and pour over the alcoholic caramel sauce and mix so the pineapple is coated. Leave to marinate like that for at least half a day. 4. When ready to bake, discard the star anise, and turn the oven to 150 degrees. Pop the pineapple and caramel in ( still using the same baking tray) and bake for 45 minutes, until the pineapple is extremely soft. 5. Leave to cool for around 7 minutes before serving as this will be exceptionally hot. 6. Serve in a bowl, with ice cream and plenty of the boozy sauce. The ideal treat for summer entertaining. 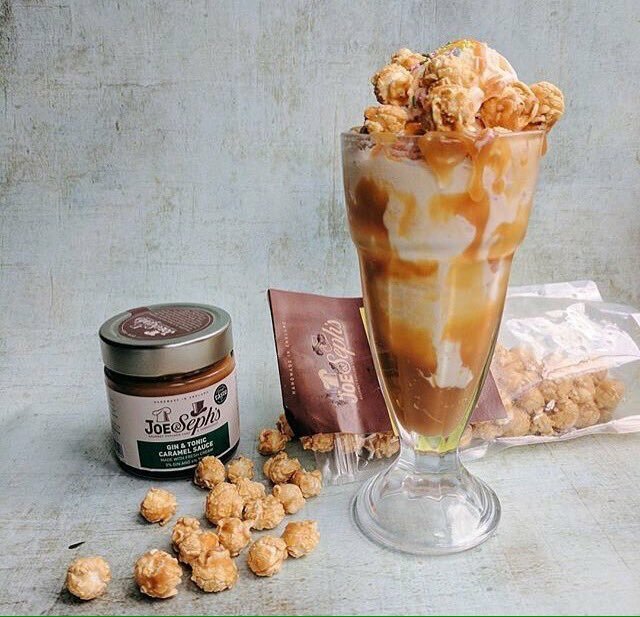 Try these Blondies from The Culinary Bee, made using our brand new Madagascan Vanilla Caramel Sauce and our poppin’ Double Chocolate Gourmet Popcorn. In a large mixing bowl, pour the sugar, melted butter, vanilla extract and eggs in, and whisk together until combined. Then add the Madagascan Vanilla Sauce, flour and salt to the mixture and add to a pre-greased tin. Put it in the oven for 30 minutes. When ready, leave to cool for 20 minutes. In a separate bowl, pour the cream in, and set it to the side. In a cereal bowl, break the chocolate up into squares, and melt in the microwave for 1 minute, checking every 30 seconds. When completely melted, pour into the bowl containing the cream. Stir until you have a glossy, thick ganache. Add the double chocolate popcorn to the ganache, stir until its completely coated. Pour this mixture on top of the vanilla blondies, smooth with a spatula, put in the fridge for 1 hour until slightly set, serve when ready to eat! These are incredibly moreish desserts courtesy of The Culinary Bee. Prepare to amaze your guests or yourself with this treat! Get a large mixing bowl, and add all the dry ingredients together, stir until mixed. Add the cubed butter into the mixture, and rub between your fingers until it becomes crumbly Then add the egg yolks and vanilla. Mould into a ball, wrap it up in cling film/plastic wrap and chill in your fridge for 30 minutes. You will not need all this mixture on the first go, I'd say save half for a rainy day, just wrap in cling film/plastic wrap and put it into your freezer. Retrieve the chilled pastry from the fridge, and roll out on a floured surface, to the thickness of a 1 pound coin or 3 mm. To bake, add to a greased tart tin, trim off any excess pastry, stab the bottom with a fork. Bake at 160 degrees for 10 minutes, line the tart filled with dried beans or rice in foil (something to weigh it down). After the 10 minutes are up, remove the foiled beans/rice, and continue to bake for 25 minutes until it resembles a biscuit. 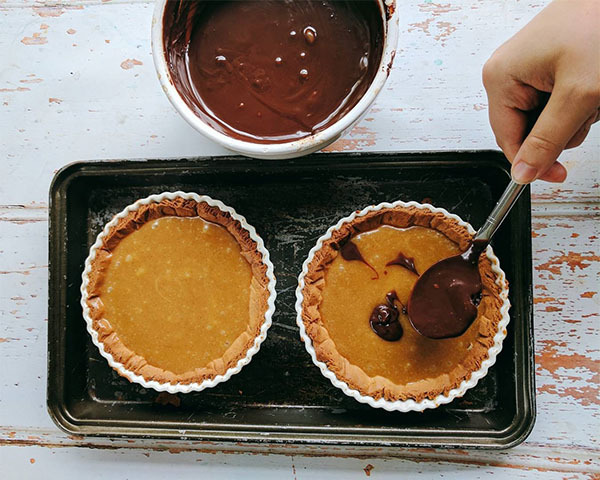 Add the Salted Caramel to each tart, and then to make the ganache. In a cereal bowl melt the dark chocolate in the microwave (30 seconds stir, then another 30 seconds). Instantly add the double cream and stir until you achieve a thick chocolatey silky texture. Pour over the caramel and leave to set in the fridge for at least an hour. Serve when ready with some creme fresh. To a large saucepan, add the oats, coco powder, sweetener, vanilla and milk together on a medium heat. Stir continuously until completely cooked. This should take around 10 minutes (if you like a thick porridge you won't need to add anymore milk to the consistency, but add as you go if you like a runnier constancy). Meanwhile, take 1/4 of a cup of chocolate (I used dark) and melt it for 30 seconds in a microwave, stir and then blast for another 30 seconds until completely melted. 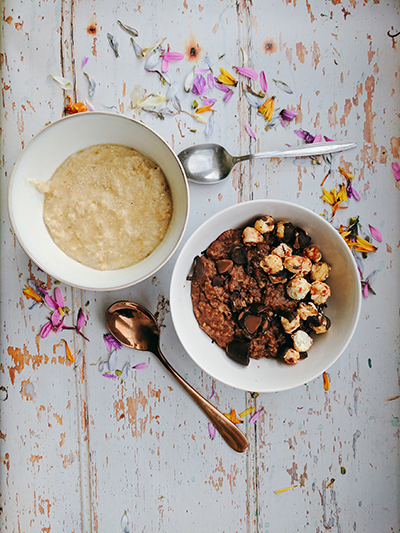 Grab a cereal bowl, and pour the porridge in, place some strawberries and cream popcorn onto the oatmeal, and ladle on the melted chocolate with a spoon. Use the same chocolate spoon for eating the porridge with, so you get that wonderfully chocolatey, strawberry bite each time! Recipe by @theculinarybee, check out her instagram page for more recipe inspo! First grease a baking tin with butter, and line with baking parchment. Turn your oven to 180 degrees. In a large mixing bowl, add the sugar, egg ,sunflower oil, vanilla and milk together, and beat until mixed. Then add all of the dry ingredients and mix together until smooth. In a cereal bowl, melt one bar of plain chocolate in the microwave for 1 minute ( after 30 seconds take out and stir). 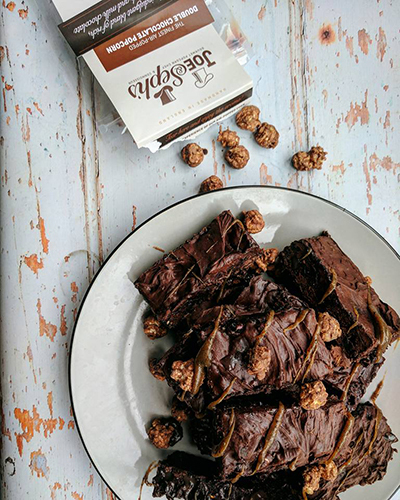 Add your Joe & Seph's Double Chocolate Popocorn, mini marshmallows and melted chocolate to your brownie mix and stir until completely coated. Add to the prepared baking tin and pop into the oven for 30 minutes. Take out and leave to cool for a minimum of 20 minutes. When cool take your jar of Joe & Seph's Chocolate Caramel Chocolate Sauce, and smother over the brownies. Now to make the chocolate ganache. Melt your other bar of plain chocolate exactly as the same before but in a heatproof jug, when completely melted, add 200ml of double cream to the chocolate, stir immediately until you have a thick ganache. Lather over the brownies ( like a chocolate spread, I would recommend using a spatula or a knife for this) . Leave to set for a minimum of 2 hours and serve! Guaranteed to be the highlight of any dinner party! For more recipe inspo visit @theculinarybee 's instagram! Melt the butter and chocolate together in a pan on a low heat. Stir occasionally until the butter has melted. Pour ½ of the cream into the chocolate mix and stir well. 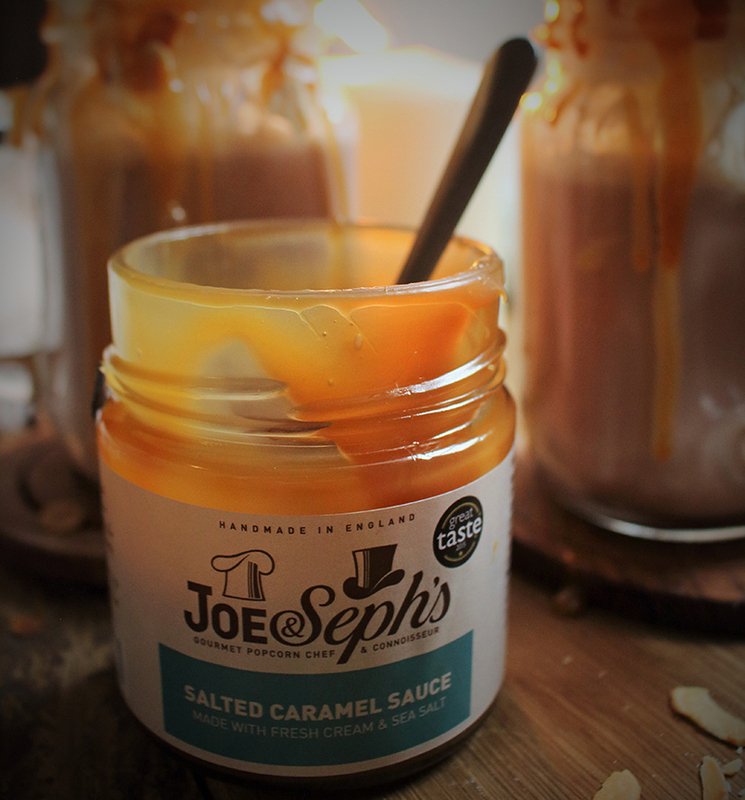 Add 1tsp of Joe & Seph’s Chocolate Caramel Sauce to the mix and stir in. Take the chocolate mix off the heat and let it cool to room temperature. Whisk up the remaining ½ of the cream until stiff and add it into the pan of chocolate mix. Stir until smooth and shiny. 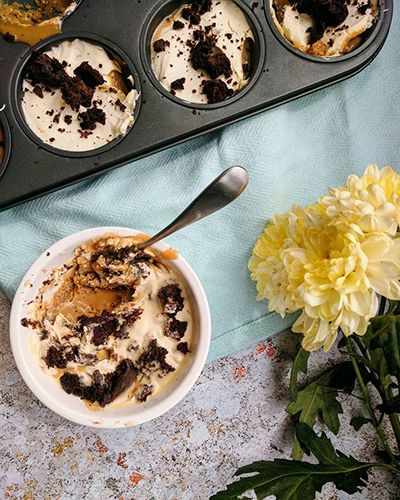 Cover the base of each ramekin with Joe & Steph’s Chocolate Caramel Sauce, then spoon on the chocolate mix. Put the filled ramekins into the fridge for half an hour, then take out and sprinkle on a couple of flakes of vanilla sea salt. Return to fridge until set (around 2-3 hours). 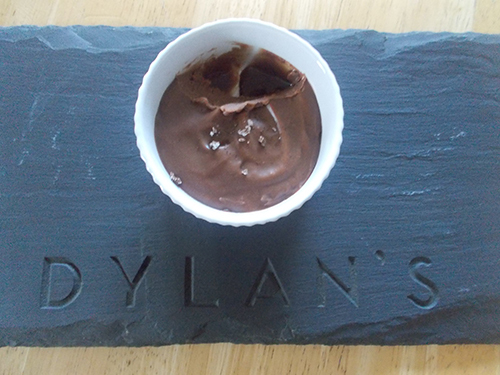 Chef tip: Rather than covering the base of the ramekin with the sauce you could try layering – a layer of chocolate mix first, followed by a layer of sauce, then a layer of chocolate mix for the top! 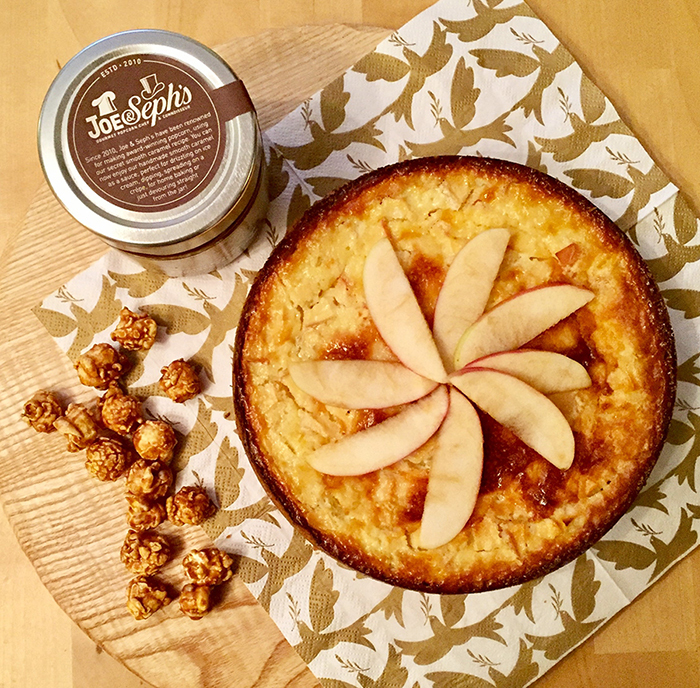 This delicious baked apple cheesecake makes the perfect pud for the festive season, using our new Brandy Butter Caramel Sauce you can’t go wrong! 1. Heat oven to 1800C. In a bowl mix together the crushed digestives and melted butter, once all combined press into the bottom of an ungreased cake tin. 2. In a bowl, beat together the soft cheese and sugar until smooth then add the eggs one by one, mixing after each addition. 3. Fold in the chopped apple pieces then pour the mix on top of the digestive base. 4. Bake for 40 minutes or until set. Once out of the oven leave to cool for 20 minutes. Remove cheesecake from the tin on to a serving plate and chill in the fridge for 1 hour. 5. Once chilled you can layer on your decorative apple pieces and serve with a drizzle of Joe and Seph’s Brandy Butter Caramel Sauce…….heaven! 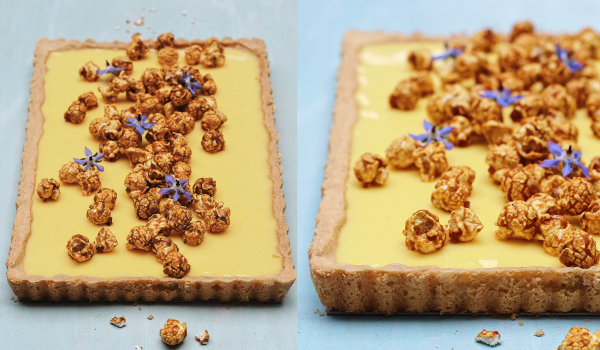 Our lovely friends over at Primrose Bakery have shared this delightful cake recipe with us using our very own popcorn. You will be mad not to try it, just look at that photo! 1. Preheat the oven to 1800C/1600C (fan)/3500F/ gas mark 4. Lightly grease a deep 23cm baking tin and line with parchment paper. 2. Put the flour and salt into a bowl, stir to combine, then set aside. 3. In a separate bowl and using an electric hand mixer, cream the butter and sugar together for 3-5 minutes until pale and fluffy. Add the eggs one at a time, mixing well between each addition. Add the vanilla extract with the last egg. 4. Add half the flour mixture and beat until well incorporated, then pour in half the milk and mix until smooth. Repeat until all of the flour and milk is incorporated. 5. Pour the batter into the prepared tin and spread it out evenly. 6. Bake on the middle rack of the oven for 45-50 minutes, until the cake is golden brown on top and an inserted skewer comes out clean. 7. Allow to cool in its tin for 15 minutes before turning onto a wire rack to cool completely. 1. Put the chocolate into a heatproof bowl and set aside. 2. Heat the cream in a small pan over a low to medium heat until it starts to simmer. Be careful not to allow it to boil. Once the cream starts to simmer, immediately pour it over the chocolate. 3. Let it stand for 30-60 seconds, then stir with a wooden spoon or rubber spatula until all the chocolate has melted and the mixture is smooth. 4. Allow it to cool to room temperature. 1. Put all the popcorn into a bowl and mix together. 2. Ice the sides and the top of the cooled cake with the chocolate ganache. 3. 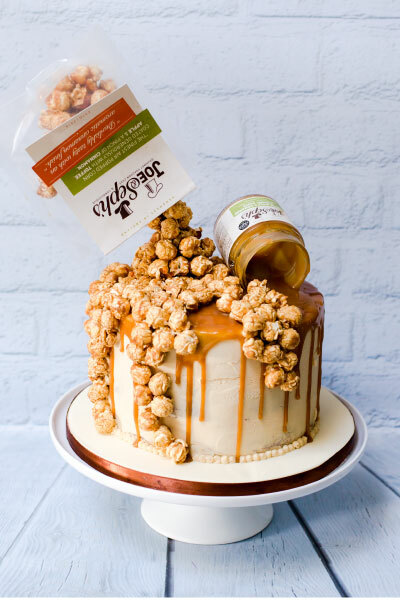 Cover the sides and the top of the cake with the popcorn, gently pushing it into the ganache to ensure it sticks. 4. 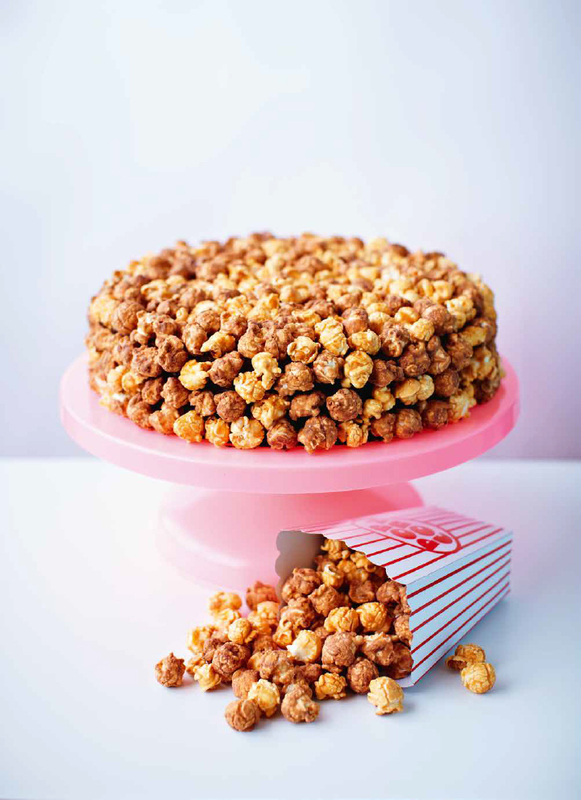 This cake is best served immediately, as the popcorn will start to go soft over time. 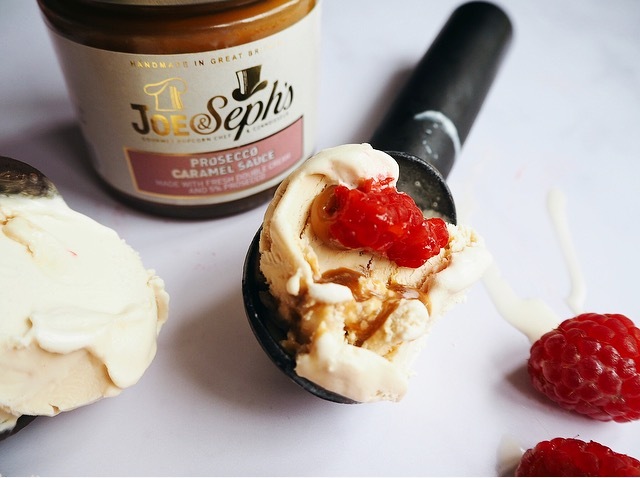 1 x jar Joe & Seph’s Gin and Tonic Caramel Sauce! Crushed lemon sherbets for the "ice"
3. Bake the cupcakes for 18-20 minutes. Check that they are done lightly pressing the cupcake with the tips of your fingers, if they spring back, they are ready! Take out of the oven and leave to cool on a cooling rack. 4. 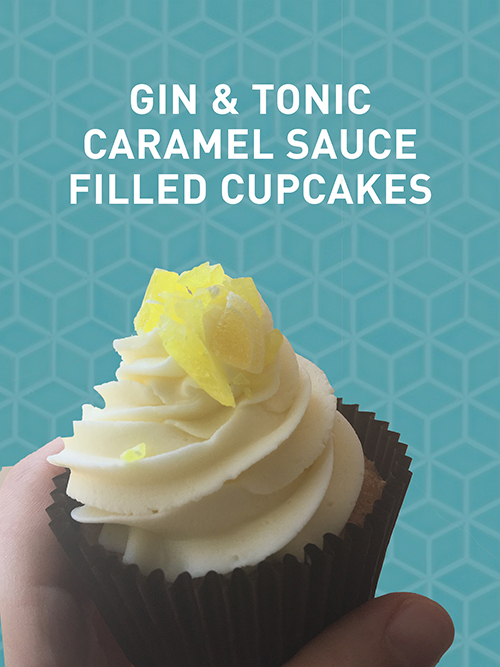 Once the cupcakes have cooled, use a cupcake corer or a knife to remove the middle of the cupcake and fill with Joe & Seph's Gin and Tonic caramel sauce. 5. Make the buttercream by mixing all of the ingredients together in a bowl until smooth. 6. Pipe over the cupcakes and top with lemon ice and a slice! Best served with an ice cold Gin & Tonic. Our Gin and Tonic Caramel Sauce goes brilliantly with fruit. (Imagine fruit-flavoured gins such as strawberry, sloe or blackberry!) This tower uses American-style pancakes and makes an impressive treat for Pancake Day. 1. Set out all the ingredients and two large mixing bowls. (American pancake batters start by mixing dry and wet ingredients separately.) In one bowl measure and mix all the dry ingredients. Sieve this into the second bowl. Then measure the wet ingredients into the first bowl and mix together with a whisk. While still whisking add the dry ingredients into the wet. Only mix until combined – do not over-mix or make the batter smooth – it should be rather lumpy. 2. Heat a cast iron griddle, crepe pan, or non-stick frying pan on a medium heat. Pour a little vegetable oil on the pan and work in with a kitchen towel. Test the pan by sprinkling a little water on to the heated surface – if it splatters it is ready. Pour 60ml of batter onto the pan and let the pancake cook until most of the bubbles have appeared and broken. Flip the pancake over using a spatula. It should be browned without being burnt. Continue cooking on the other side until browned. Remove from the pan and place on a wire rack to cool. 3. To make the coulis, wash the blackberries and add to the pan with the water and the sugar. Heat the pan on a medium heat and cook until the blackberries begin to soften. Blend the berries in a processor or blender and pass through a fine sieve. Keep pushing the fruit into the sieve, extracting as much of the fruit as possible from the seeds. Serve cold or warm. 4. Using a 9 cm circular cutter, press out a disc from each of the 12 pancakes. Whisk the cream to stiff and spread onto each pancake disk. Divide the blackberries between the pancakes and construct each tower making three layers with berries between the layers. 5. Place a jar of Gin and Tonic Caramel Sauce in a small bowl of hot water for a minute or two. This will make pouring easier. Drizzle each tower with Gin and Tonic Caramel Sauce and serve with the fruit coulis. This recipe is in collaboration with What Dad Cooked, follow them on Twitter, Facebook & Instagram @whatdadcooked. These turnovers use crepes cooked in the oven. Apples go well with Joe & Seph’s Sticky Toffee Sauce (think toffee apples!) and in this recipe it is used inside the pancakes. 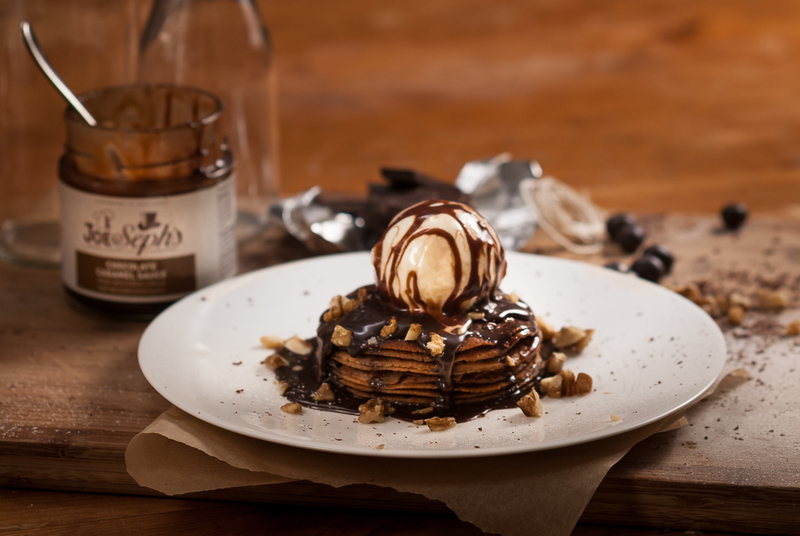 A great way to enjoy pancakes and Joe & Seph’s sauce on Pancake Day. 2. Heat a 20cm - 24cm crepe pan or frying pan on a medium to high heat. Pour a small amount of vegetable oil on the pan and work into the surface with a kitchen towel. Use the retained batter to practise and help season the pan. Take about 70-80ml batter and pour onto one side of the pan, immediately swirl the batter around and down to cover the whole pan, pouring off the excess into a bowl (the excess can be added to the batter and used again.) When the crepe is covered with small holes and browned on one side, carefully turn the crepe over with a spatula and cook on the other side until browned. Place the cooked crepe on greaseproof paper over a cooling rack. Interleave each crepe with greaseproof paper to make a stack. Continue until all the batter is used. You should have at least 12 good crepes (any crepes that are not used can be wrapped in paper and kept in the fridge for heating up later). 3. Preheat the oven to 200C Gas 6. 4. To make the turnovers, peel and core the apples cutting them into quarters and then slicing into chunks. Place one quarter of the apples in a pan with 160ml apple juice and 160ml water. Heat the pan and simmer the apples for 5 minutes, then add the remaining apples and cinnamon and a pinch of salt and cook for about 3 minutes. The filling should be partly puree (from the apples that were cooked first) but also retain apple chunks that are tender but firm. Add 100ml of Sticky Toffee Sauce. Stir gently and cook for a further minute and then take off the heat. 5. To prepare the crepes, melt the butter. Using a broad pastry brush apply butter on the more attractive brown side. Then turn the crepe over and put about 60ml of filling in the centre of the crepe. Fold two sides over the filling, then fold the bottom over the mound of filling, and roll the turnover over the top part of the crepe to form a cylindrically-shaped turnover. Place on a backing tray with the fold on the bottom. 6. Put the turnovers in the hot oven and cook for approximately 8 minutes, watching carefully to ensure they do not burn. Remove from the oven. 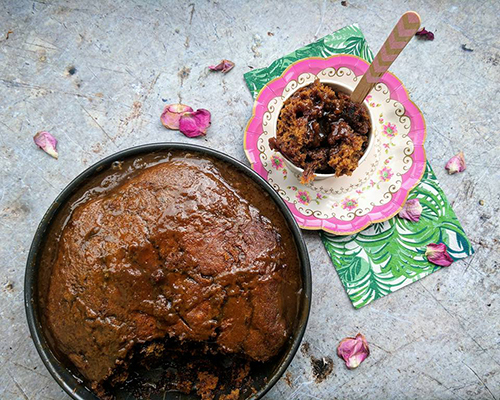 Serve with cream or ice cream and more Sticky Toffee Sauce if you like. 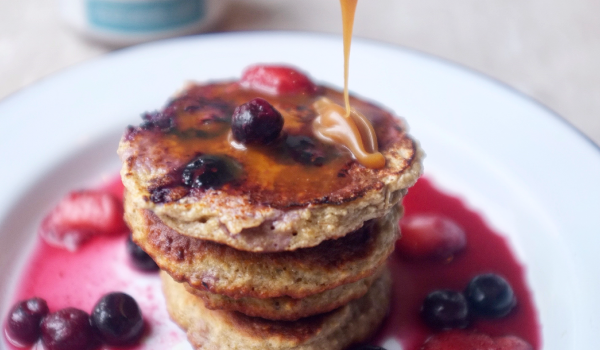 We strive to produce the best tasting popcorn and caramel sauces so it only seems fitting that we bring you the best tasting pancake recipes?! 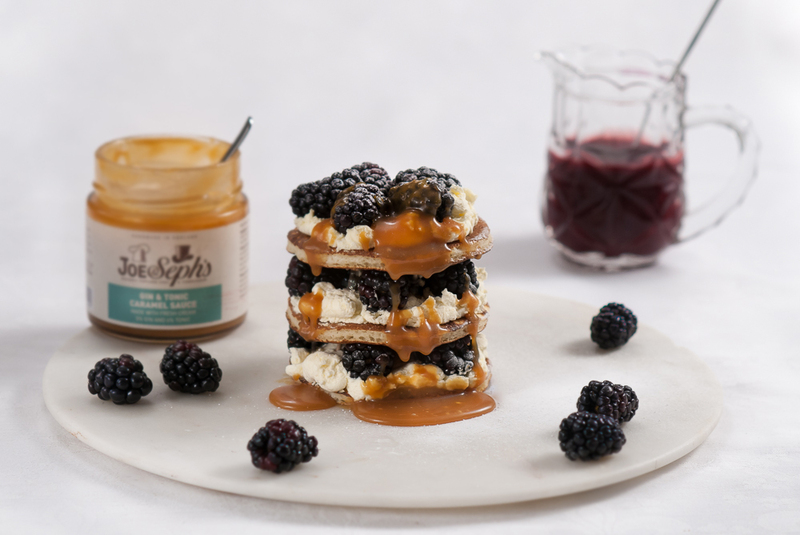 Our friends, What Dad Cooked have used our award-winning Salted Caramel sauce to create the ultimate Banoffee Pie Pancakes! 2. Heat a 20cm - 24cm crepe pan or frying pan on a medium to high heat. Pour a small amount of vegetable oil on the pan and work into the surface with a kitchen towel. Use the retained batter to practise and help season the pan. (These can be kept aside for later.) Take about 70-80ml batter and pour onto one side of the pan, immediately swirl the batter around and down to cover the whole pan, pouring off the excess into a bowl (the excess can be added to the batter and used again.) When the crepe is covered in small holes and is cooked and browned on one side, carefully turn the crepe over with a spatula and cook on the other side until browned. Place the cooked crepe on greaseproof paper over a cooling rack. Interleave each crepe with greaseproof paper to make a stack. Continue until all the plain batter is used. You should have at least 12 good crepes. 3. To make a banoffee ‘pie’: first peel and cut the banana in half, then make four slices along the length of the banana halves. 4. Whip the cream until it reaches the stiff peak stage and place in a piping bag. 5. With each crepe, fold in half, then make a triangular ‘cone’ shape by folding the crepe in thirds, using centre of the crepe’s straight edge as the point of the cone. 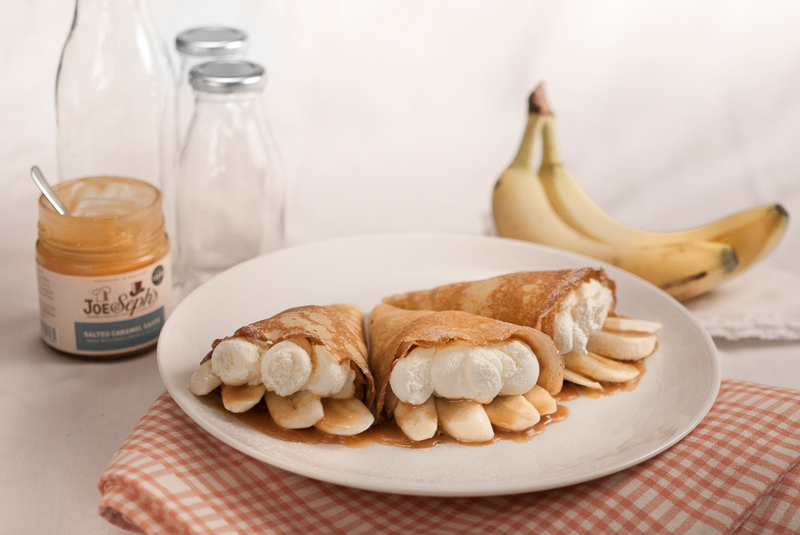 Place sliced bananas in the crepe cone and fill each with whipped cream. 6. Finish the presentation with salted caramel sauce poured under the cream and over the bananas. If preferred do this use a piping bag. A classic dessert adapted for Pancake Day by What Dad Cooked using our chocolate caramel sauce in the crepes as well as a delicious sauce..Yum! 1. In a large bowl whisk together the milk, cream, eggs, salt and sugar. Slowly whisk in the flour until very smooth. If preferred this can be done in a large food processor or blender in two batches. 2. Measure out 900ml of batter, keep the remaining batter. In a separate bowl whisk together the measured batter and chocolate caramel sauce. 3. Heat a 20cm - 24cm crepe pan or frying pan on a medium to high heat. Pour a small amount of vegetable oil on the pan and work into the surface with a kitchen towel. Use the retained batter to practise and help season the pan. (These can be kept aside for later.) Take about 70-80ml batter and pour onto one side of the pan, immediately swirl the batter around and down to cover the whole pan, pouring off the excess into a bowl (the excess can be added to the batter and used again.) When the crepe is covered in small holes and is cooked and browned on one side, carefully turn the crepe over with a spatula and cook on the other side until browned. Place the cooked crepe on greaseproof paper over a cooling rack. Interleave each crepe with greaseproof paper to make a stack. 4. Continue until all the plain batter is used and then start with the chocolate batter. The chocolate crepes will be more delicate than the plain. You should have about 12 chocolate crepes. Preheat your oven to 175 degrees C (fan.) Grease and line two 18cm round cake tins. Then whisk in the rest of the flour, the milk, vanilla and spices until you have a smooth cake batter. Fold in the diced pear pieces. Divide the mixture equally between the two cake tins and spread it out evenly. Bake in the centre of the oven for 25 minutes until golden and springy to the touch. Meanwhile, prepare the pears for the topping: Peel the pears and then using a sharp knife, cut them lengthways into thin slices, retaining the core and stalk. In a large bowl, mix together the sugar and spices and then dip each piece of pear into the spiced sugar mixture to coat it. Lay the pear pieces on a wire cooling rack over a baking tray. Once the cake is done, remove it from the oven to cool in the tins. Put the baking tray with the pears into the oven and immediately turn the heat down to 145 degrees C (fan.) Bake the pears for an hour, turning the slices half way, until they are dried out and golden. To make the icing, beat the mascarpone in a large mixing bowl with an electric whisk until smooth. Add in the icing sugar, vanilla, butter and milk and whisk until you have a silky, lump-free icing. To assemble the cake, cut each half into two so that you have 4 equal tiers. You will have to flatten out one of the two tops but leave the other one rounded as the very top tier. Arrange the bottom tier of cake on your serving plate. Top with a quarter of the mascarpone icing and a layer of Joe & Seph’s Sticky Toffee Caramel Sauce. Repeat this with two more tiers and then top the final tier with the remaining icing. Drizzle over some more caramel sauce and then top with the dried pear pieces. Serve straight away. 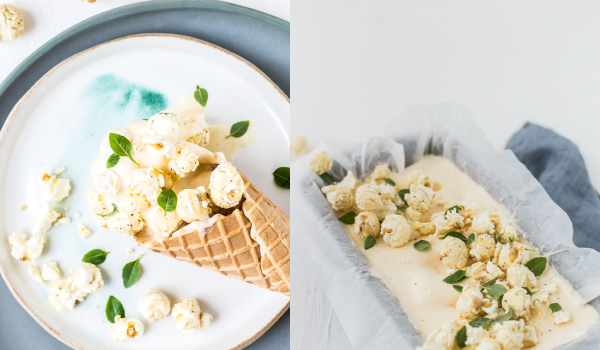 Here's a favourite recipe from our very own Head Pastry Chef, Karoline Qualmann. 1. Bring milk, butter and salt to the boil in a sauce pan over a medium heat. Tip in the flour and stir .the mixture should form a smooth paste which leaves the side of the pan clean. Tip - Do not beat the paste at this stage or it will become oily. Set aside to cool for about 15 minutes. 2. When the paste has cooled slightly, the eggs can be incorporated. Beat in the eggs gradually and continue beating until the paste is smooth and very glossy. The paste is now ready to use. 3. Using a piping bag, pipe neat globes of choux paste on to a baking tray, trying to avoid forming a peak at the top. Allow plenty of space between the buns for rising Bake at 180 Celsius in a preheated oven for 20 minutes. 4. Remove the buns from the oven and place on a cooling rack. Once cooled, cut a little whole at the bottom of the bun and fill it with pastry cream or whipping cream using a piping bag. 5. 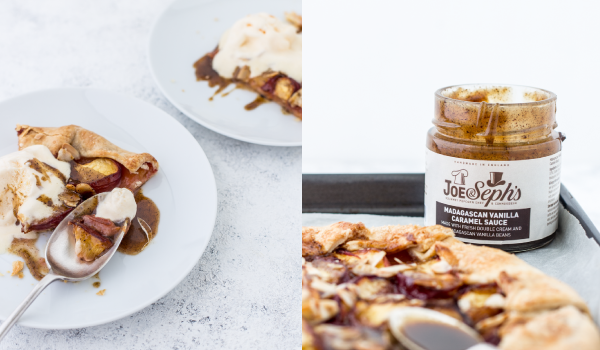 When ready to serve, drizzle in Joe & Seph's Chocolate Caramel Sauce (for a runnier consistency, add the sauce to a microwaveable container and heat on full power for 10 seconds). 6. Sit back and marvel at your creation, allowing a few minutes for the applause from your dinner guests to die down, and tuck in. 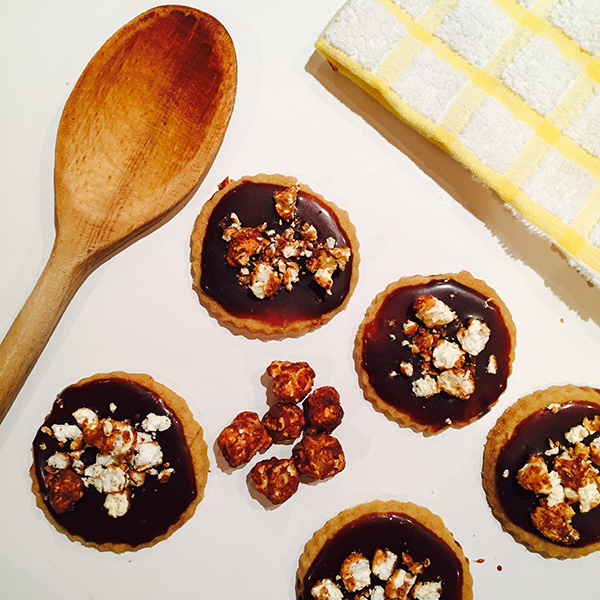 Another great recipe from our esteemed Head Pastry Chef, Karoline Qualmann. 1. Separate the egg yolks and egg whites. Whisk 4 egg yolks with 20g caster sugar and in a separate bowl, mix 3 egg whites with the remaining 50g sugar and a pinch of salt until the mixture is pale, thick and stiff. 2. Carefully fold the two egg mixtures together in a large bowl, and seive the plain flour into the mixture, stirring gently as you go. 3. Using a pallet knife, spread the mixture on a tray with grease-proof paper laid on it, to approximately 1cm thick, and place in a pre-heated oven at 180 celcius, for 7-8 minutes. 4. Remove from the oven and place on some parchment paper already dusted with icing sugar and peel off the grease-proof paper. 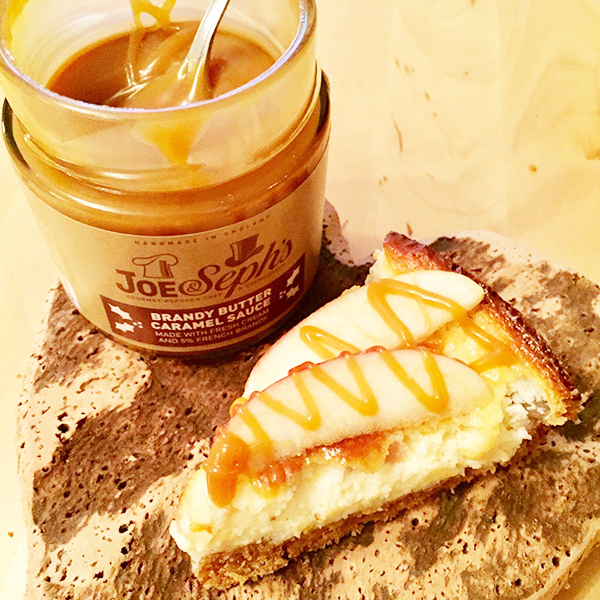 Spread the Joe & Seph's Sticky Toffee Sauce on, followed by a generous helping of whipped cream. 5. Let the good times roll (i.e. carefully roll the cake to a cylindrical swiss roll shape and let it cool for 1 hour). This hour wait is a perfect opportunity to lick the bowl that the cake mixture was in. Sprinkle icing sugar to serve. Pat yourself on the back (or ask a friend to help you). 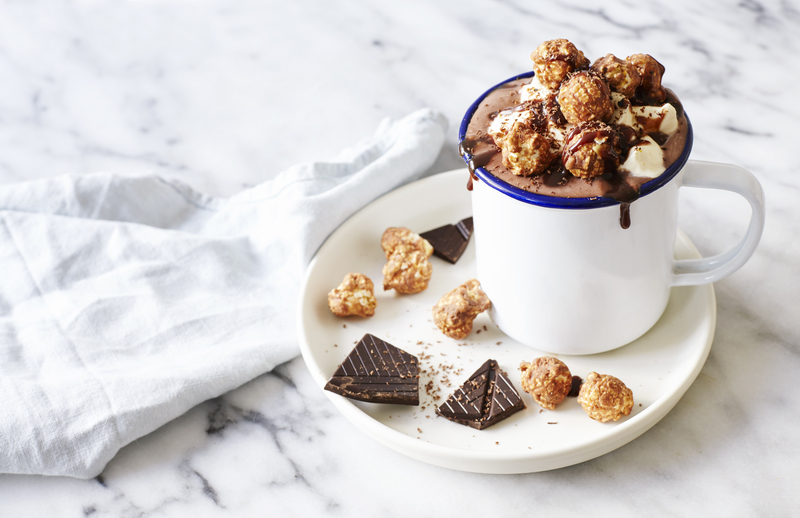 A super simple way to enjoy our Chocolate & Hazelnut Sauce. Perfect for Breakfast in bed! 1. Toast the sliced brioche in a toaster or under the grill. 2. Liberally apply Joe & Seph's Chocolate & Hazelnut Sauce. Enjoy.